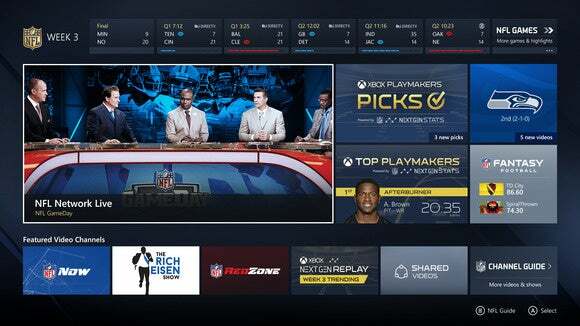 Microsoft's updated NFL app has arrived on Xbox One and Windows 10, just in time for the start of football's regular season. The new release brings a number of improvements, chief among them the addition of "Next Gen Stats" from games including information about player speed, distance traveled and acceleration. Those stats get integrated into new features including replays that show the paths of each player on the field, for people who want a detailed breakdown of what happened. Like last year, the app lets fans follow their favorite teams, track the results of their fantasy football teams and view videos from the NFL. On game day, users can "check in" to games that they want to keep tabs on in order to receive notifications about the score while they're playing other games on Microsoft's console. The app is part of Microsoft's technology partnership with the NFL, which has also seen the company provide Surface tablets for player and coach use on the sidelines. Interestingly, the Next Gen Stats data is collected from sensors players have attached to their pads and then stored by the NFL in Amazon's cloud, not Microsoft's. Microsoft is using the app -- especially the Next Gen Stats features -- to promote the Xbox One to American football fans at a time when sales of the console still trail the PlayStation 4. Right now, Microsoft's platform is the best place for fans to find those statistics, and the company is selling a bundle that includes a Xbox One and a copy of "Madden 16." It may also help drive adoption of Windows 10, which the company released a month ago and has already been activated on 75 million computers.